Whelp. That’s it and that’s all, folks. 2019 Winter is a wrap! Or pretty darn close to it. The ski area is closed. 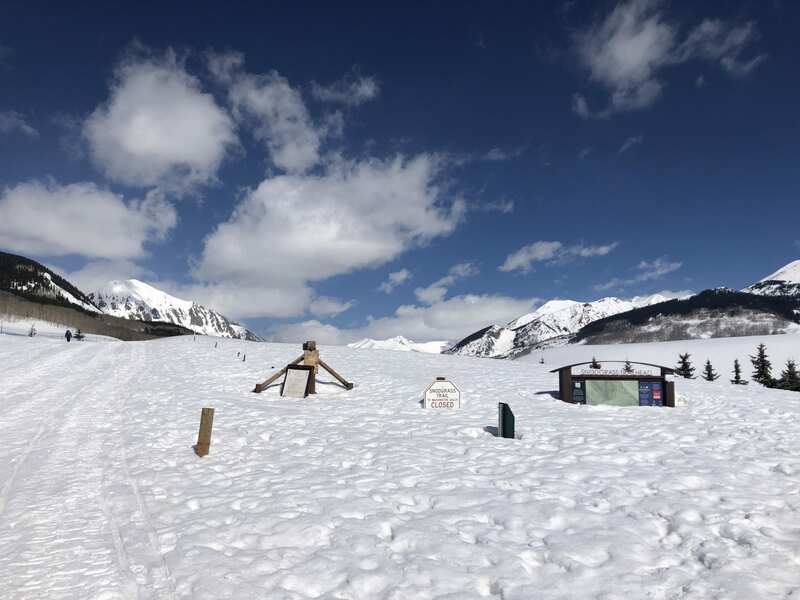 The CB Nordic center is closed. And most of our fat bike grooming operations have come to an end. You can still crust-ride (or -ski) up at North Village, Teddy’s, and the Golf Course if you follow the bamboo, but be sure you go early enough in the day that the snow is nice and firm! The bamboo is getting pulled in those areas this week. Once we pull the ‘boo, please direct your riding to public lands elsewhere. Cement Creek, however, is still up and running! We were able to extend our grooming permit for that area to the end of the month, and Al is still hard at it. Go enjoy all that snow! But PLEASE be careful. Check the CBAC Avalanche Forecast before heading out, know your avy conditions, and make safe judgements about where/when you travel. With all these closures and the ample snow, it can be super tempting to get out and crust ride, well, everywhere. But legally you can’t just point it wherever you want to go. It is absolutely critical you stay on public lands where travel is permitted. Neglecting to do so could compromise our access for the future! Just because CB Nordic is closed doesn’t mean you can ride on their trails. It is beautiful out there, so we do encourage you to get out where allowed! Let’s all keep it beautiful by riding when conditions permit (are firm enough) and picking up after our pups. Bottom line: use your head, go ride/ski out Cement Creek, and get the road bike out to enjoy these warm temps! The CBGTrails app is the absolute best way to know where you are and what the rules are for a given trail. If in doubt, don’t do it! Make your way to public lands and enjoy the snow as long as you can.